The week started off right with Monday as a holiday and our family being invited to Will's 8th birthday party! We met up for lunch at a splashpad park with Will and friends. Auntie Jo had pizza, hot dogs, salads and breadsticks- yum! A pinata full of delicious candy and time in the water on a warm day was the perfect combo. For the first day of school on Tuesday, we had a sleepy 3rd grader who was feeling a bit anxious about new things in store. We opted to skip the morning bus and Jane drove Cam into school where he was excitedly greeted by his classmates and all was well in his world. The remainder of the week was busy and fun for the first few days back at Meadow Brook elementary. 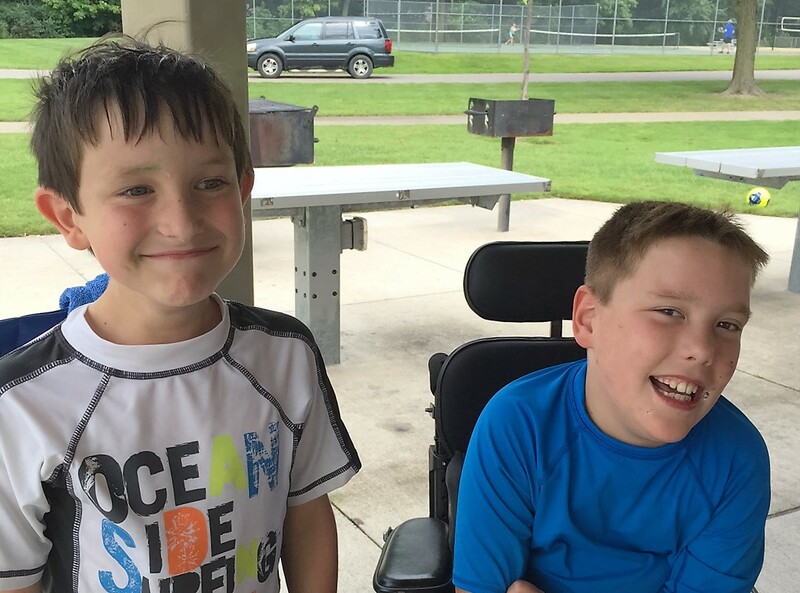 Cam is a GVSU Laker this year and his buddy and school classmate, Brody, is on his team. It was quite a day for fans with Oma, Opa, Patti, Sarah and Emma all in attendance! Miss Kathy, Cam's teacher, was also there and Uncle Ray and Aunt Mary made an appearance too! The Hope College Girls Softball team volunteered as helpers for opening day. Cam's helper, Brita, was a freshman at Hope and from Indiana. She loved hanging out with Cam and told us she is a Special Olympics volunteer back home. 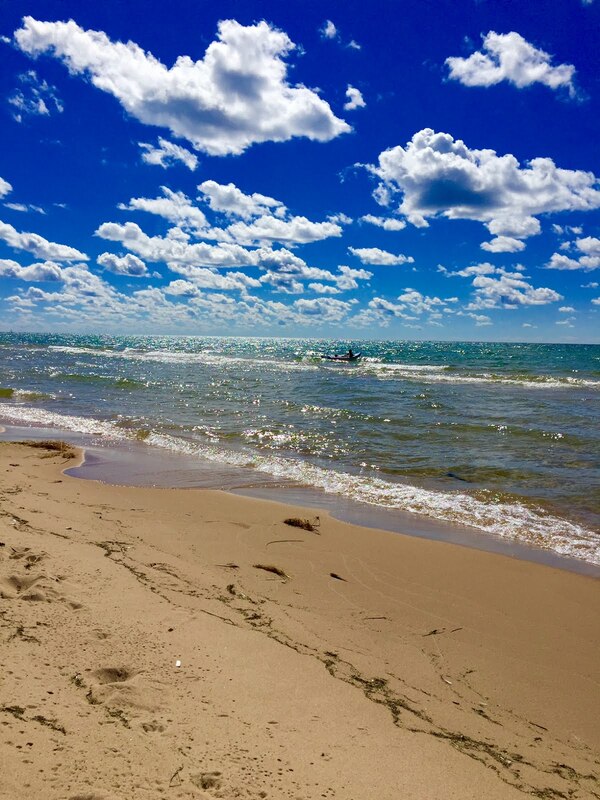 Sunday marked our last play day in Lake Michigan at the cottage. We were thankful the water temps were normal and the waves weren't too high. 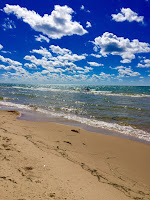 The sand was warm and the lake sported differing shades of blue and green. 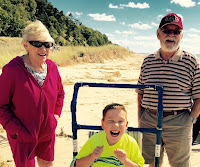 Cam still enjoys "baking" with Oma on the beach and each time they create a new concoction with sand and water. The kayak rolled over the waves and gave us all a fun ride as Chris expertly rowed through the whitecaps. Cam likes to go on official tours during these rides so we can talk through all of the sights along the lake shore. We love our time at the big lake with Oma and Opa soaking up the sunshine and playing in the waves. It's always bittersweet to say goodbye to summer, but we'll enjoy it all again next year. Hugging our Michelle as she headed off on her move to Florida was also bittersweet. We're happy she'll be back in her favorite sunshine state but we will miss her daily dose of fun, laughter, silliness and adventure. "The best things in life are the people we love, places we've been, memories we've made along the way..."
Thank you for blessing us, Michelle. We look forward to making more memories! "Isn't that a great idea?!" "Oh yeah, sure. Sounds good..."
"What did I just say?"